Reissue of the instantly sold-out Volume 3 of the now-legendary Guitars From Agadez series. 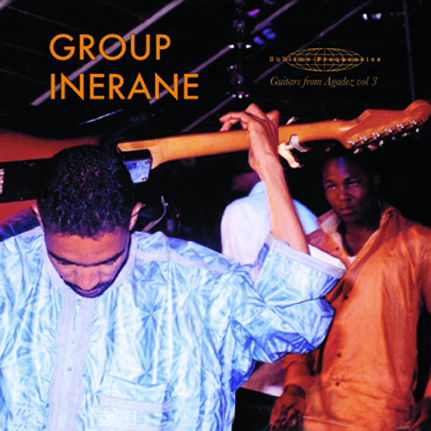 Group Inerane's sophomore LP is the latest missive from the now-sound of Niger's Tuareg guitar scene. Led by guitar hero Bibi Ahmed, this new incarnation introduces another legend on second guitar, one Koudede Maman. Koudede is considered to be a cornerstone of the second wave of the Tuareg guitar lineage, while Tinariwen and Abdulla Oumbadougo are the godfathers of the scene and Group Inerane and Bombino are the third and most current incarnation of the Tuareg's voice for hope and equality. Koudede's addition to Group Inerane's line-up arises from unfortunate circumstances -- Adi Mohammed, Inerane's original second guitarist, was shot dead in the endlessly festering rebellion battles. This new line-up is testament that the music of the Tuareg will not be stopped. The sound represented on this album is the apex of the trance stun guitar style that this scene has perfected. This is rock music as played with Saharan modes. There is a propulsive entropy to these songs that is infectious and narcotic! Two guitars, bass and drums chug along on a hypnotic choogle that rivals both the Magic Band's early '70s marathon workouts and The Velvet Underground's drone on tracks like "Sister Ray." This is music made from revolution and its message of hope and validation of equality of the Tuareg way of life is unstoppable. Recorded by Hisham Mayet on location in Niger's capital Niamey in 2010 as travel to Agadez was forbidden by the military Junta that had just overthrown then President Mamadou Tandja. Limited edition LP comes in a beautiful full color gatefold jacket; digi-pack CD comes in a beautiful full-color LP-style gatefold jacket. Both include photos of the musicians and liner notes by Hisham Mayet.